A strong aftershock of the March 11 Pichilemu earthquake occurred today, at 12:29:49 local time (16:29:49 UTC), National Emergencies Office of Chile reports. The earthquake had a magnitude of 5.9, and occurred 13 kilometers southwest of Lolol, O’Higgins Region, at a depth of 50 kilometers. The United States Geological Survey, however, reported the earthquake had a magnitude of 4.9, and that it occurred at a depth of 64.9 kilometers. 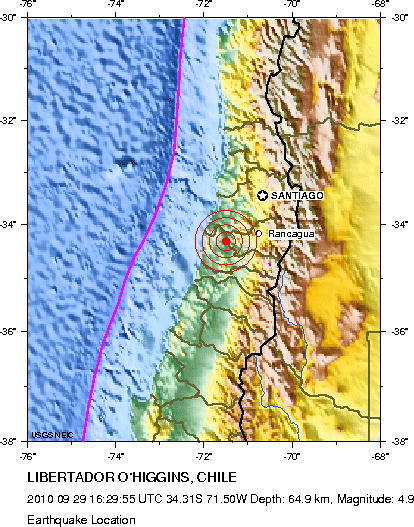 The epicenter was located 70 kilometers west-southwest of Rancagua, O’Higgins; 80 kilometers north-northwest of Curicó, Maule; 80 kilometers south of San Antonio, Valparaíso; and 125 kilometers southwest of Santiago, Metropolitan Region. The University of Chile Geological Service, for their part, reported the earthquake had a magnitude of 5.6, and that it occurred 43 kilometers southwest of Santa Cruz, at a depth of 51 kilometers. The aftershock was clearly felt in Pichilemu; schools quickly evacuated to secure zones. There were reported power outages in Lolol. Telephone calls were truncated for a few minutes in O’Higgins Region. No infrastructural damage or casualties have been reported. According to BBC News, eight aftershocks have occurred along the coast of O’Higgins Region, between magnitudes of 3,1 and 3,7.